It’s a hot day and you’re taking the car for a long drive, but before you get to your destination, you notice the temperature gauge is way up, and smoke is coming out of your bonnet. Your car is overheating! 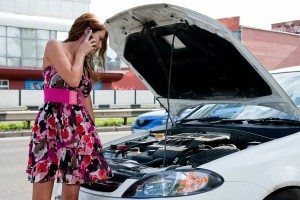 Why is your car overheating and what do you do? A car overheats because there’s not enough coolant circulating inside the engine. Coolant is essential for maintaining an appropriate operating temperature in your vehicle, so it’s important to ensure your coolant is at the right level to avoid damaging your engine. If your car continues to overheat after topping it up with coolant, bring your vehicle into Auto Giant and have it looked at by a team of experienced and trusted mechanics. We will find the cause of the problem, fix it and get you back on the road in no time. If you’re driving and unable to pull up anywhere quickly, the first thing you should do is shut off your air conditioner and open your windows. You could even turn on the heater to blow excess heat from the engine into the car. Once you’re able to pull over, pop open your bonnet and give your vehicle time to cool down before checking the coolant level. If the level is too low, top up the tank with coolant. If you don’t have any coolant on hand, water will also temporarily ease the problem. If the coolant tank is full, an electrical or mechanical problem may be the cause. If this is the case, arrange for your vehicle to be towed to a repair shop. IMPORTANT NOTE: Whatever you do, don’t take the radiator cap off your vehicle while it’s overheating. Wait for the vehicle to cool down first or you may risk getting burnt. Low Coolant – The most common cause for an overheating engine and the easiest problem to fix is a low level of coolant. This is easily fixed by topping it up. Ample coolant is vital for keeping your engine running at an appropriate temperature. Cooling System Leak – Constantly low coolant may be due to a leak somewhere in the cooling system. You may also notice coolant collecting on the ground under your car if there’s a leak. An Obstruction – There could be a few sources for an obstruction that results in overheating. A mineral deposit may be blocking the radiator, a foreign object may be blocking the cooling system or perhaps the thermostat doesn’t open when it should. Water Pump Fail – The water pump is the most active cooling system component. It’s also responsible for creating circulation. A water pump can fail due to the bearing or impeller inside the water pump wearing down or breaking, causing it to no longer turn. It won’t take long for the engine to overheat if this is the cause of the problem. Cooling Fan Isn’t Working – If the temperature gauge is creeping up, there could be a problem with your cooling fan. This could be caused by the fan motor burning out or a bad radiator switch. These are some of the leading causes for overheating that we come across in our workshop. However, there are many other possible causes for your overheating problem which is why it’s important to allow our Auto Giant repairers to accurately diagnose the problem. If My Car Overheats Can I Still Drive It? You should only resume driving your vehicle once the coolant has been topped up. You must not drive your car if it’s out of coolant entirely and you’re unable to top it up. Serious damage can be caused to your engine if there’s no coolant in your vehicle while driving. If you don’t have any coolant or water available to top up your coolant tank, or if the problem persists after topping it up, it’s best to order a tow truck to transport your vehicle to the nearest repairer. If a coolant leak seems to be the cause of the problem, topping up the coolant will only temporarily alleviate the problem, giving you just enough time to drive your vehicle to a mechanic for repairs. If your vehicle continues to overheat after topping up your coolant, bring it into our repair shop right away. It’s very dangerous and harmful to your car if you don’t find and fix the cause of the overheating problem as soon as possible. At Auto Giant, our experienced mechanics are pros at repairing overheating vehicles. Depending on the cause of your overheating problem, the process of finding the problem, fixing it and undertaking any other repairs to your damaged engine can be complex. So it’s always worthwhile to take your vehicle to a mechanic you can trust rather than trying to fix it yourself. Speak with an Auto Giant mechanic today on (07) 3881 2900 for trusted advice or to book your vehicle in for repairs!